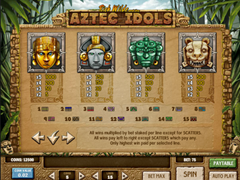 Aztec Idols Pokie Review - Play Today! Mr Rich Richard Wilde is introduced by the Play’N’Go and he is ready to take the adventurer in you, on a wild winning ride to the South American jungle. The game offers the excitement of a treasure hunt on 5 reels with 15 paylines. Great additional wins are guaranteed from the variety of features such as free spins, scatter and extra scatter symbols, wilds, bonus symbols and bonus games. The wins streams in from all directions and the jackpot adds yet another 5.000 coins in the bonus pay-out. The game is played with 15 lines, the amount of lines per spins can be lowered to as little as one line per spin. The game will also give you the opportunity to wager up to 5 coins per line, this will increase the winnings and wager amounts. At maximum bet you will wager 75 coins, which will then be multiplied by $0.01 to $0.25 as your bet per coin. Fantastic graphics takes players on a wonderful treasure hunt to find the greatest winning combinations on the reels. 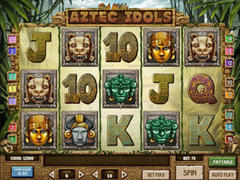 The symbols offers colourful idols such as the Aztec lion with big dangerous teeth, the green face with golden earrings, grey Aztec king wearing a golden crown, golden mask with blue precious stone eyes and a golden nose ring and the poker symbols set in stone with colourful Aztec decorating art. The explorer will complete the symbols that are wild. The game will show them on all the reels with great features to assist you in combinations. The explorer symbol can replace any other symbols when it’s shown in a position where it can substitute for a symbol and complete combinations. Awards will be given according to the pay-table. Golden temple symbols are bonuses and will activate the bonus game when you manage to obtain 3 or more of them in a combination. The game will show 5 idols to choose from that provide prizes. Choose as many as possible, but be aware of the haunted idol as it will end the bonus game. The haunted idol will explode with green smoke and provide no bonus awards. Winning collected prior will be paid out. Free spin game will be awarded when 3 of the selection plates are shown on the reels at any time. These are scatters and will not require to show in any combinations to award the feature. The game will offer a 5x wager rewards when the game is triggered. You will find the game selects a random symbol to replace your scatter on the reels and to show the amount of free spins you win. The replacement scatter symbol will award wager multipliers during the feature. The game starts off by impressing players with the great design and then surprise them with great outdoor sounds. Wealthy wins keeps the fast spinning reels rumbling with joy and hours of entertainment is offered through additional wins from the features. Give this great game a try today.